Place the butter and oil in a saucepan or pot and add the vermicelli or orzo. Over low-heat, fry until their color starts changing to golden brown. Do not over fry, take the pot from the stove as soon as you see the golden brown color and add the rice. Then, again place the pot on the stove and stir for 3-4 minutes over medium heat. Finally, add the hot chicken stock / water (If you leave the rice in water before cooking, use 1 ½ cup hot water otherwise use 2 cups). Add the salt and close the lid and cook over low heat, until the rice absorbs all the water. Meanwhile you can stir once or twice. Let the pilaf stand for about 5-10 minutes before serving. Tereyagi ve siviyagini bir tava ya da tencereye alin ve sehriyeleri ilave edin. Dusuk ateste sehriyeler kizarmaya baslayana dek cevirin. Ates uzerinde fazla birakmayin, kizarmaya baslar baslamaz ocaktan alin ve pirincleri ilave edin. Orta ateste 3-4 dakika pirincleri kavurun. Son olarak, sicak tavuk suyunu/suyu ilave edin ve karistirin (Eger pisirmeden once pirinci suda beklettiyseniz, 1 ½ su bardagi sicak su, eger bekletmediyseniz 2 su bardagi kullanin). Tuzu da ilave edip kapagini kapatin. Pilav suyunu cekene dek, dusuk ateste pisirin. Pisme esnasinda 1-2 defa karistirabilirsiniz. Servis yapmadan once 15-20 dakika dinlendirin. I'm from Romania, but me and my family love very much turkish cusine. I made "Pilaf with vermiceli", it was so tasty !! 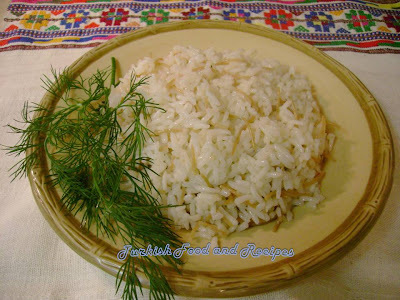 This Pilaf turns out perfect! I served it a week ago with your White Beans with Meat (Etli Kuru Fasulye) and tonight I am making it again to serve with grilled Greek Chicken and spinach salad. Yum!